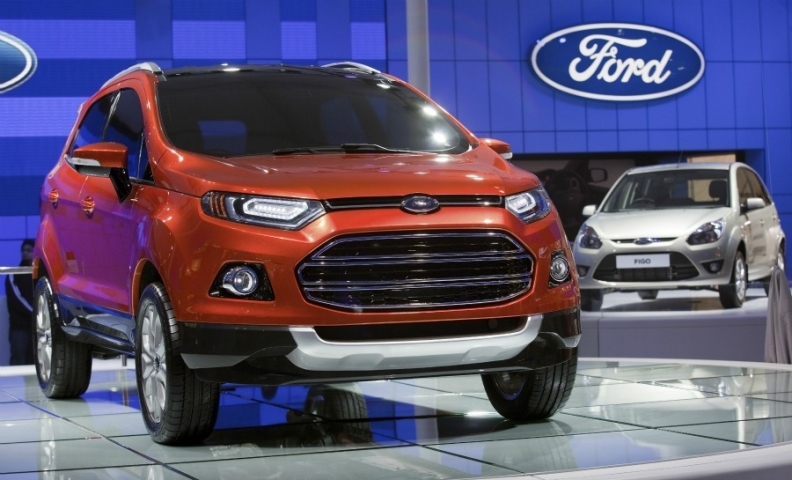 Ford will build the EcoSport, shown at the New Delhi auto show, in the company's Chennai plant in south India. MUMBAI -- Ford Motor Co. and Renault SA are among automakers unveiling at least 15 sport-utility vehicles and vans in India this week as they count on larger autos to spur demand in a market traditionally dominated by small cars. "As the customers' incomes grow, they want to upgrade to a bigger car," said Joe Hinrichs, Ford's president for Asia Pacific and Africa, after introducing the EcoSport SUV in New Delhi on Wednesday. "A lot of people, when they want to upgrade, may upgrade to an SUV that gives you extra space and height." Automakers are focusing on faster-growing emerging markets to make up for reduced demand in Europe as the region's economy slows with the sovereign-debt crisis. Toyota Motor Corp. and Nissan Motor Co. are also introducing new or revamped SUVs at this week's New Delhi auto show after India's record pace of interest-rate increases damped demand for small cars accounting for more than two-thirds of sales in the country. "People buying SUVs have deeper pockets," said Deepesh Rathore, managing director for IHS Automotive in New Delhi. "Even if they buy it with a loan, they won't wait for the interest rates to come down. But a person buying a small car may hold off the purchase until the rates decline." Sales of SUVs rose 11 percent during April to November, while car sales fell 3.5 percent, according to the latest data by the Society of Indian Automobile Manufacturers. Total car sales may expand as low as 2 percent in the year ending March 31, after surging 30 percent last year to 1.98 million units, according to the automaker's group, which said last month it may again lower the forecast. SUV and van sales in India will triple to 1.3 million units a year by 2020 from 434,000 at present, IHS forecasts. About 80 percent car purchases in the country are funded with bank loans, according to IHS. Hyundai Motor Co., South Korea's largest carmaker, unveiled a concept van, Hexa Space, at the show Thursday. The automaker currently sells the Santa Fe SUV in India, along with seven other cars. Maruti Suzuki India Ltd., the nation's biggest, displayed XA Alpha, a compact SUV concept. It will unveil the Ertiga van tomorrow, according to a statement. "When customers move up the value chain, they want to move from a small car to a small SUV," said Mayank Pareek, the head of sales at New Delhi-based Maruti, a unit of Japan's Suzuki Motor Corp. "As the Indian car market grows, we find that customers in urban and semi-urban areas want SUVs to project a sporty and rugged sort of image." Maruti expects sales of such vehicles to expand at about 15 percent annually for the next five years, according to Pareek. He declined to disclose the sales target for the Ertiga, a vehicle with three rows of seating. Gasoline and diesel variants will go on sale in the second quarter of 2012. Automakers are also introducing more SUVs as such pricier models may offer higher profit margins, said Mahantesh Sabarad, an analyst with Fortune Equity Brokers Ltd. in Mumbai. "With rising competition in the small car space, the margins are getting lower and manufacturers don't have any pricing power," Sabarad said. "In the SUV space, there is a wider price bracket and lower competition. So the margins are likely to be better." Mahindra & Mahindra Ltd., India's biggest SUV and tractor maker, had an earnings before interest, tax, depreciation and amortization margin of 20.5 percent in the year ended in March, compared with 9.45 percent for Maruti, according to data compiled by Bloomberg. Mahindra's net income in the year rose 24 percent, while Maruti's declined 9 percent. Mahindra will display for the first time in India a range of SUVs from Ssangyong Motor Co., the South Korean company it acquired last year. The vehicles include the Rexton and Korando models that the Mumbai-based automaker plans to start selling in the country this year. In October, Mahindra began selling its XUV500 model to compete with Tata Motors Ltd.'s Aria and General Motors Co.'s Captiva. Priced between 1.1 million rupees ($20,721) and 1.3 million rupees, the XUV500 received 8,000 orders in 10 days, equivalent to four months' production. "People are willing to pay a little more for an SUV rather than have the same small car that their neighbors own," said Sanjeev Varma, a Michigan-based senior automotive adviser at Duff & Phelps LLC. "In India, image is important and everyone wants to have something different." Rising demand for diesel-powered vehicles in India is also helping SUVs as most of such models run on the fuel. The nation's fuel pricing policy has pushed the difference between diesel and gasoline to 60 percent, compared with the 28 percent gap in June 2010. Gasoline is 28 percent higher in New Delhi. PSA/Peugeot-Citroen, Europe's second-biggest carmaker, will display a range of vehicles at the auto show as it prepares to return to India after a 15-year absence. The Paris-based company is setting up a 650 million-euro ($841 million) factory in the western state of Gujarat with a plan to sell as many as 170,000 vehicles in India by 2016. Renault is showcasing the Duster SUV, which will go on sale in the country later this year. Its affiliate Nissan will start selling the Evalia van in India this year. The New Delhi show, in its eleventh edition, will see 1,500 exhibitors displaying products at the Pragati Maidan trade fair ground, according to a statement. More than 50 new models, including 32 passenger vehicles, 9 two-wheelers and 6 trucks, will be unveiled at the event.